(NaturalNews) Caffeine often goes under the radar, not easily recognized as an addictive substance. According to caffeine researcher Professor Laura Juliano, more than 50 percent of caffeine users say they've had trouble cutting back or quitting caffeine. Many people believe that it's easy to cut out caffeine, but there are some who can't seem to live without it, especially when it comes to their daily dose of coffee. 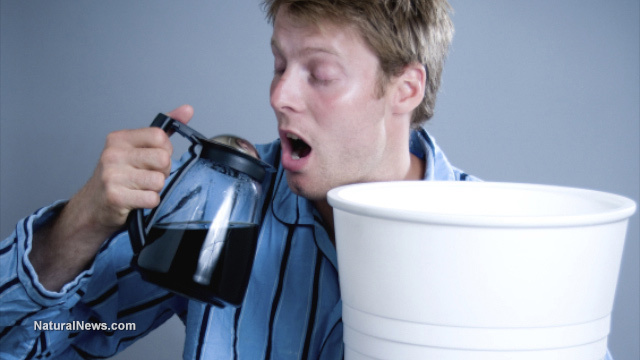 Now, caffeine addiction is no longer being viewed as a physical issue, especially in the case of coffee addiction. According to the American Psychiatric Association, more research needs to be conducted on how caffeine affects people psychologically. Their concerns have coined a new term called Caffeine Use Disorder which has made its way into the newest version of the DSM. Dr. Charles O'Brien of the newest DSM committee is beginning to look more closely into the matter. "For a use disorder, it would have to be people who are compulsively drinking coffee and having it interfere with their behavior," said Dr. O'Brien. For daily coffee consumer Jessica Hayes, her day starts like it does for many -- brewing up a jolt of java to jump start the day. "I feel like it helps me be more productive," she said. Jessica's doctor has urged her to cut back. The daily jolt of java isn't helping her condition of acid reflux. She recognizes the burning sensation in her esophagus after downing her morning dose of java, but she can't seem to cut the daily habit out of her life. "It's definitely something that I fight with myself all the time," she said. Professor Juliano is beginning to see many more like Jessica reach out for professional help, showing how overlooked caffeine use disorder has become. "It would be beneficial if treatment guidelines were developed in the same way that we've developed them for tobacco," said Professor Juliano. It's possible that groups named Caffeine Anonymous may one day welcome those looking to get off caffeine. Treatment could include counseling, but Juliano believes that some patients may need to follow through with a detox and outpatient program. For Jessica, just saying "no" to her caffeine addiction isn't enough; she admits that, if treatment was available, she'd give it a shot. "I would absolutely want help," she said. For those addicted to caffeine-loaded beverages like coffee, there may be a very important reason to go through with a detoxification program. The brain may actually be addicted to coffee's cadmium content. The missing link, the reason why many people can't stop drinking their morning cup of java, may lie in the heavy amounts of cadmium that stimulate the brain. A whole-foods, fruit-and-vegetable detox diet may be needed to bring down levels of cadmium in the body. Consuming large, adequate amounts of zinc may help push unwanted cadmium out of the cells, since zinc and cadmium are similar in structure and compete with each other for absorption. In fact, a diet high in zinc may help coffee addicts wean themselves off of the cadmium surge they receive when they drink the java. Zinc could help push the addictive cadmium out of the cells. A coffee addiction may actually be a cadmium addiction, since the metal ions act as a stimulant by themselves. A hardened personality and an angered and inhibited mind may be a sign of cadmium toxicity. Since coffee is typically heavy in cadmium, daily consumption of java may overburden the body over time. A detox diet loaded in zinc may be the answer for what professionals are beginning to coin as "caffeine use disorder."